The Virgin of the Rocks. Two versions of a masterpiece. 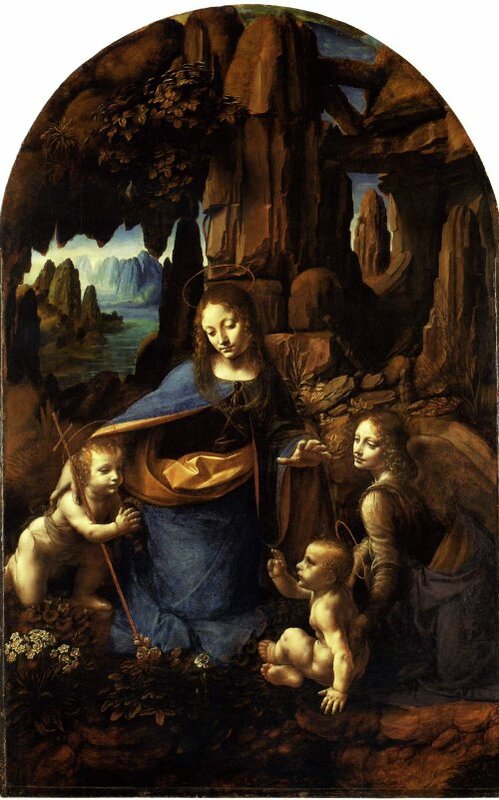 It seems strange that in The Virgin of the Rocks we see two complete versions of a subject from an artist who failed to finish so many of his commissions. 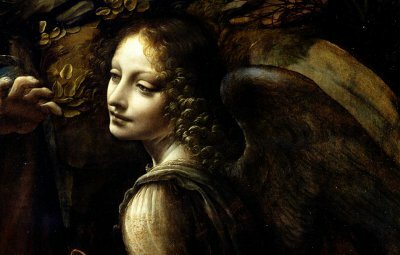 Leonardo's Louvre version of 1483/1486 is the earlier of the two works while the National Gallery painting is dated 1495/1508. Both paintings are oil on panel but the Louvre version has been transferred to canvas. The painting may have suffered some damage during the transfer process but its condition is now stable. The Leonardo exhibition at the National Gallery in London (Leonardo da Vinci, Painter at the Court of Milan) displayed these two works together in the same room for the first time ever. Although never achieving the same monumental impression gained by seeing the works in the flesh, I have placed images of the paintings side by side so that direct comparisons of the similarities and differences can be made. 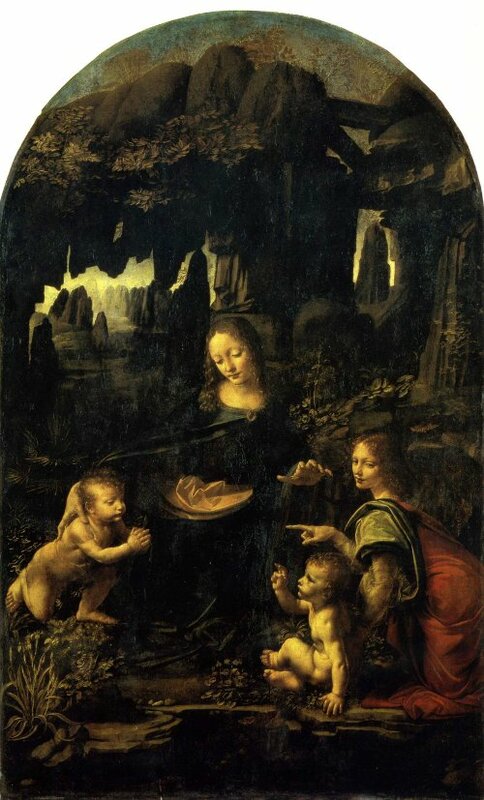 The Virgin of the Rocks was commissioned (not long after Leonardo's move to Milan) by the Franciscan Confraternity in the Church of San Francesco Grande. Leonardo was assisted by two local artists, the Predis brothers, their task was to create an altarpiece for the recently completed chapel dedicated to the Immaculate Conception of the Virgin Mary. The Predis brothers completed two side panels while da Vinci painted the centre panel. Shortly after the altarpiece was finished the artists became embroidered in a dispute about payment resulting in the artists threatening to sell the work to a rival bidder. 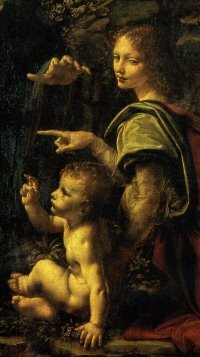 It is likely that this dispute resulted in the making of the second version of the Virgin of the Rocks, the one now in the National Gallery in London, and in fact, it was the London Virgin that was placed in the chapel in San Francesco Grande. The original Paris version was quickly sold to an art lover soon after completion. The Virgin or the Rocks. Leonardo da Vinci. (s) 199 × 122 cm, 78.3 × 48.0 Louvre, Paris. The Virgin of the Rocks. Leonardo da Vinci. (s) 189.5 × 120 cm, 74.6 × 47.25 National Gallery, London. 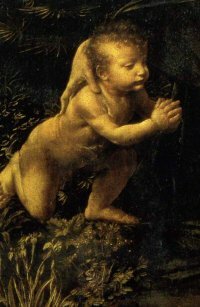 The subject of the paintings is a legendary meeting between the infant Jesus and John the Baptist on the flight into Egypt. The Madonna is at the centre of the composition with Jesus seated with the angel Uriel his arm raised in blessing, John's hands are seen clasped in prayer. I have seen both of these paintings and don't really have a favourite, although the London version seems to be more tightly finished than the one in the Louvre, I like them both. How's that for sitting on the fence? 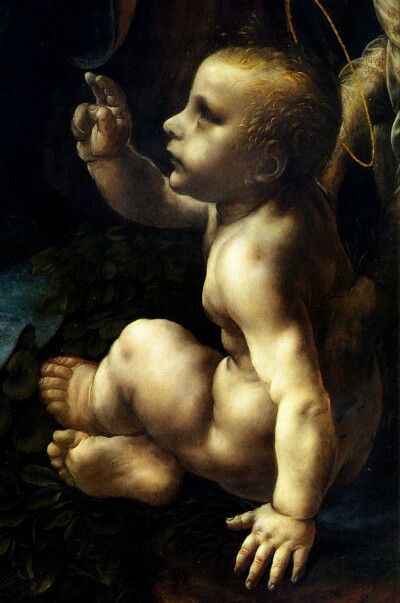 The brushwork and contrast between light and dark (chiaroscuro) is typical Leonardo and standing before these paintings you do feel the power and the presence of the great artist. It really is shiver up the spine time! The Side Panel Musician Angels. These are the two side panels of the Altarpiece, the Angel with the Violin is the left panel and the Lute playing Angel is the right panel. The Angel in Green's attribution to the Predis brothers, Ambrogio and Evangelista, has been disputed in recent times. Possible candidates for the work include Marco d' Oggiono and Francesco Galli, however, the debate continues! 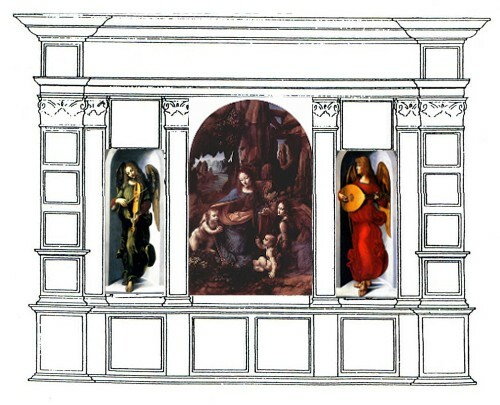 This diagram with the paintings in their correct positions gives some insight of how the altarpiece would have looked. In the London version halos have been added as has John the Baptist's staff, also John's is pose has changed slightly from the Louvre version. The angel Uriel no longer points at the figure of John and these changes are probably intended to clarify the identity of the two infants. 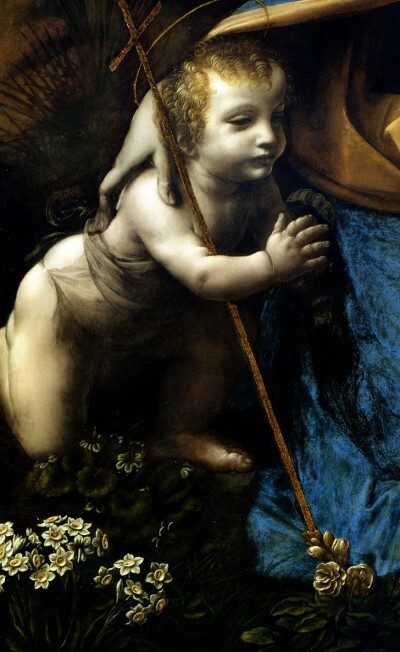 This resolves and dismisses any suggestion that the child closest to the Madonna is Jesus and not John the Baptist.